Banning greyhound racing is a politically and emotionally charged issue. Prior to the government’s backflip, the NSW Greyhound Racing Industry Alliance criticised the Special Commission of Inquiry report as being ‘biased and seriously flawed’. It argued that racers and trainers were denied procedural fairness. There were allegations that the report was a ‘stitch up’, with the result predetermined by NSW Premier Mike Baird. The greyhound industry even brought a claim in the NSW Supreme Court, seeking to have the report declared invalid. Others applauded the ban, and saw it as an enlightened means of securing animal welfare. While we might debate the merits of banning greyhound racing, these events raise a broader legal question: should a former High Court judge have played such a prominent and decisive role in such a political and tumultuous issue? a former judge should be satisfied that any proposed professional or commercial activity is not likely to bring the judicial office into disrepute, or put at risk the public expectation of judicial independence, integrity and impartiality. In Australia it is common practice for former judges to be appointed to a wide range of government positions. These positions include appointments as Royal Commissioners or the heads of anti-corruption bodies. Former judges are also regularly appointed to law reform bodies, or to conduct reviews or monitor statutory schemes in, for instance, the national security arena. They may be appointed as the independent lawyers tasked with making public interest submissions in closed hearings (usually referred to as ‘special advocates’ or ‘public interest monitors’). It is not a coincidence that governments appoint former judges to these roles. It is often the case, rather, that governments appoint former judges to utilise the experience and expertise, independence, status and reputation that they will bring to the role. While these practices may be common in Australia, there are strong arguments that the conduct of former judges, including in accepting roles as commissioners, might affect public confidence in the integrity of the judiciary, just as much as the conduct of sitting judges. The public often makes little distinction between a former judge and a sitting judge. Confusion is often compounded by the nature of media reporting: in this case, much of the news reporting about the Commission report has directly linked Michael McHugh with his former role on the High Court. Such reporting means that a former judge’s conduct has the capacity to undermine public confidence in the judicial institution. More particularly, confidence might be harmed by the appointment of retired judges to positions where there might be integrity concerns if a sitting judge were appointed. In the case of McHugh and the Greyhound Racing Commission, there have been accusations on social media and reported in traditional media that have questioned the Commission’s integrity, independence and legitimacy. This has been compounded by the action that has been brought against the Commission in the Supreme Court alleging, among other things, failure to accord due process. Such accusations might lead to doubts about the integrity of Michael McHugh, which, given his position as a former judge of the High Court, might then lead to doubts about that institution. This could have serious consequences for public confidence in the judicial institution. 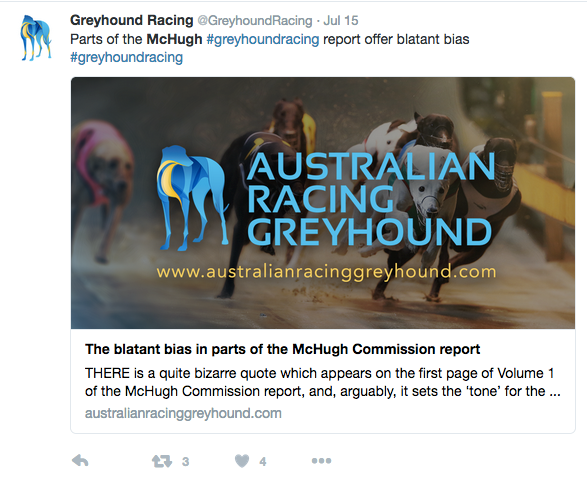 It is not particularly unexpected that such public controversy has arisen around the conduct of the Greyhound Racing Commission. It is certainly not the first time a former High Court judge has caused controversy in heading a Royal Commission: John Dyson Heydon and the Royal Commission into Trade Union Corruption is just one other spectacular example. Both Commissions involved highly political subject-matters: the Labor Party labeled the Heydon Commission a partisan stunt when it was announced; greyhound racing has been a hot political issue, at least since the airing of the Four Corners episode revealing the continued practice of live baiting in February last year. Similarly, the report by Ian Callinan into the NSW lockout laws has waded into highly political territory. The McHugh and Heydon episodes demonstrate that these appointments place former judges into highly political roles, and expose their conduct and behaviour to intense scrutiny. In a paper we delivered at the International Legal Ethics Conference VII in July, we called for a more concerted focus on the ethical risks of former judges occupying these sorts of roles, and considered how we might best manage those risks in practice. We are not alone in being concerned about these issues: indeed, there is increasing interest in what judges do after they retire. The Federation of Law Societies of Canada’s Standing Committee on the Model Code of Professional Conduct has recently prepared a discussion paper on Post-Judicial Return to Legal Practice, in an attempt to review the appropriateness of existing restrictions. However, even in Canada there has been limited consideration of the wider roles judges may play in retirement. In years gone by, when the prevailing norm was judicial appointment for life, or even when judicial retirement ages were introduced but life expectancy or quality of life into older age was lower, the question of the regulation of retired judges raised less cause for concern. Today, however, the retired judge, usually, although not always, somewhere in their early to mid seventies, will have fruitful decades ahead of them. The rising numbers of retired healthy and active — professionally and socially — judges raise complex ethical regulation questions. With increasing life expectancy, these questions will not go away any time soon. If we retain judicial retirement ages (or, even if they are abandoned), we need to adopt a more coherent regulatory response to these ethical issues. AGLC3 Citation: Gabrielle Appleby and Alysia Blackham, ‘Greyhounds, Michael McHugh and the Integrity of the Judiciary’ on Opinions on High (19 October 2016) <http://blogs.unimelb.edu.au/opinionsonhigh/2016/10/19/appleby-blackham-greyhounds/>. This entry was posted in Opinions, Slideshow by ablackham. Bookmark the permalink. On the other side, who better than a judge to preside (and preside fairly) over inquiries into important matters and get to the truth? There will always be criticism, often unfair criticism, when judges decide cases in their usual line of work. This includes political criticism (whether because the case touches on government policy, or because the case is an emotive one which clashes with societal expectations). Judges can’t avoid this happening and shouldn’t, because then we’re letting external criticism interfere with judicial decision-making. Of course a party against whom Justice McHugh has made negative findings seeks to impugn his reputation. Why give it such credence? Rather, we (and politicians) ought to be trying to educate people on the role of judges so that they don’t lose trust in the institution merely because they disagree with a particular judge in a particular case, or disagree with what the judge does outside the courtroom (whether in a quasi-judicial role or just in his or her private life). Even in the case of Justice Heydon, I don’t feel that the lesson there is “retired judges shouldn’t preside over Royal Commissions” but “be careful about presiding over nakedly political Royal Commissions, especially if you are going to associate with one political party”. And the damage was more to Justice Heydon’s reputation rather than that of the judiciary anyway.